Monday, February 4th, 2019 marks the first day of Aurora WDC’s 25th year. You’re invited to celebrate with us all year long, but more immediately actionable for you and your teammates, we’ve got our final discount live and running through midnight on Valentine’s Day for you to join us in-person at our flagship event. We will sell out; the time is now. The last week of April, 150 or so of our best friends will reconverge (see what I did there?) on UW-Madison’s Fluno Center for our 2019 RECONVERGE:G2 Intelligence Leadership Symposium, now in its eighth iteration. For the next 10 days, you’ll get in for $1195 ($700 off the regular ticket price) and your whole team can join you for just $695 each. As usual, we’ll be exploring some new territory with this edition of G2 that I’ll tell you about in a moment, but first, let me show you what you missed last year. We’re grateful to our amazing co-chairs, Rich Caldwell from Northrup Grumman and Mandy McLean from Xcel Energy, who guided the design of this year’s theme. You’ll get to meet them both and hear first-hand how intelligence leaders can drive effectiveness in their organizations by embracing the broader mission of every intelligence client: GROWTH. I joke sometimes that if I’d known we’d still be going strong today back on that cold winter morning in 1995, I’d have done all the right things faster and made a lot fewer mistakes. But the truth is, making mistakes is where all the real lesson-learning happens. Like many, I didn’t know which lessons I needed to learn! As a history undergraduate at the UW-Madison, the broad variety of geographies, time periods and subject matter I studied had one surprising thing in common that had eluded me until my mid-40s: LOSERS. That simple realization has changed how I look at the intelligence programs, processes and priorities Aurora is privileged to assist and advise on. Looking back, I have always had sympathy for the failures in our world and that seems to have driven my personal search for empathy with them around the signals of impending doom that preceded their downfall. At what point was loss transformed from mere potential to undeniable inevitability? When and how were these early warning indicators undetected or unaddressed in time to make a difference? Why didn’t those with dominion over the controllables in each case use that power effectively? I can see now that my empathy for losers is what led me to my career in intelligence. Ultimately, this motivated me to find a language for programming converse results more intentionally: SUPERIORITY. Mistake-making in business – particularly around programming successful growth strategies – isn’t just where all the learning happens, it also exhibits a repeatable pattern of unforced errors that winners and losers alike indulge in, over and over and over … seemingly without ever learning why! Sometimes the “winners” are really just non-losers who had enough of a capital cushion (cash) to sustain the losses until they could recapitalize. The entire venture capital industry is based on this principle! IF you are perfectly calibrated for the results you’re now getting (aka less than ideal results), THEN what must be recalibrated to produce different results? Over the past 15 years, I’ve been working on more unified perspective on programming growth strategies with a set of ideas called the Angles of Attack. 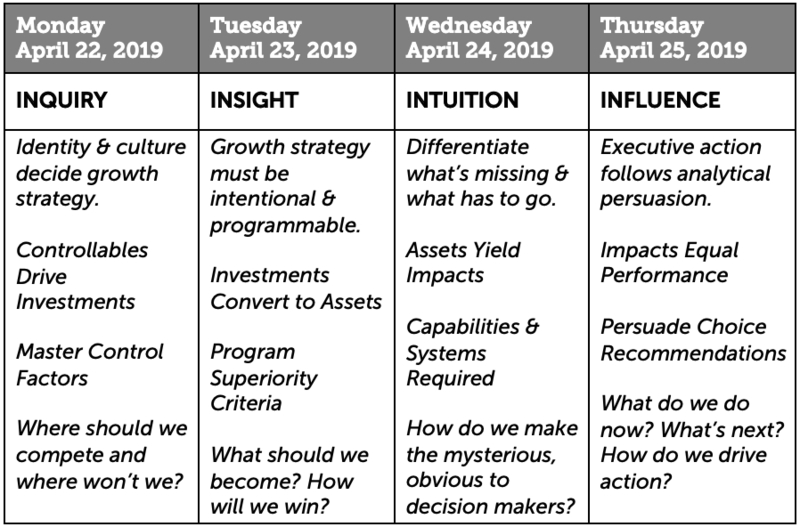 What these ideas represent for growth executives and the intelligence professionals who support them is a systematic mindset and methodology for fine-tuning the intelligence apparatus around the ultimate interpretation of intelligence in business: Superiority Analysis. In pursuit of this bold new vision, we’ve redesigned the G2 Symposium (again!) around experiential problem solving instead of lectures or workshops. When you come to Madison in April, you’ll bring with you a growth-related business problem or challenge that you’ll have been coached in advance to address during the meeting. This is why we encourage you to bring your colleagues, clients or partners by pricing additional teammate tickets at a steep discount. Solo attendees will still bring their strategic, market or competitive growth problem to work on alone, you just won’t have the benefit of collaborating with colleagues on it, unless you take advantage of the tools we’ll provide for engaging your team back at the office in real-time. Ok, smart guy. How do you design a conference around individually-tailored learning experiences yielding real business value for such a diverse audience from every industry? Well … I’m not smart enough for that. But my team is. I’ve tasked every single person at Aurora WDC to join a curation team for each day and take ownership of that day at G2 2019 so we can perfect a real-world problem-solving experience unlike any other. Here’s the overview of each day’s themes. The value proposition for this year’s RECONVERGE:G2 is simple: Come in with a growth-oriented business problem and come out with an actionable solution based on sound analysis. It’s like a custom-designed workshop for you and your team – without the custom-designed price. What other “conference” or “training” will you attend this year where you’ll get that level of structured attention? That’s why we’ve made it as easy as possible to bring your entire, cross-functional team. Intelligence isn’t only for intelligence professionals. It’s for decision makers of all types in executive roles, marketing, product innovation, R&D, and finance. Bring them! Show them what intelligence can do! Even if it’s just you making the trip this year, we will make the experience valuable by teaming you up with other professionals and new ventures to work on problems together. In the end, that broader mission for intelligence is why the entire experience needed re-engineering. There isn’t another experience like this one. We will share more details on the lesson plans for each day in the coming weeks, but this is your last chance to attend RECONVERGE:G2 at a significant discount. 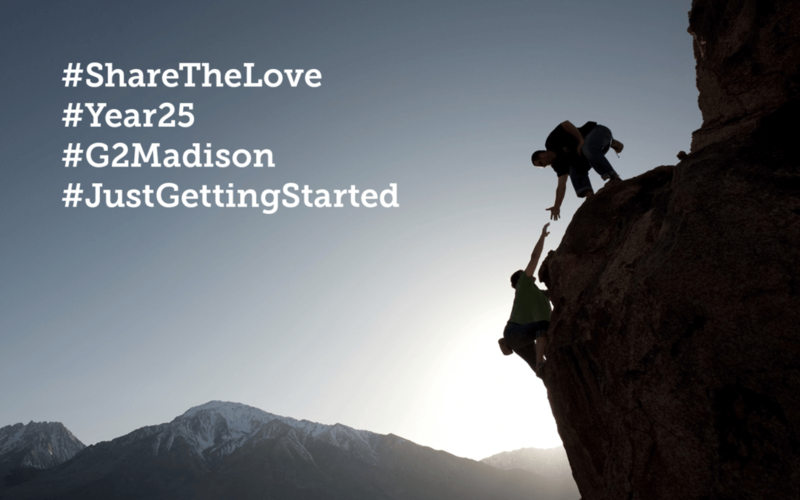 I hope you’ll join me, especially during #ShareTheLove the next 10 days, in celebrating Aurora WDC’s 25th year and then join us in person in Madison this April. Aurora WDC serves organizations worldwide in their efforts to win in the marketplace, deploy technology to amplify insights, and build a culture of intelligence. Its three offerings - Aurora GPS research and analysis services, FirstLight cloud-based intelligence management software, and RECONVERGE social learning community - have been crafted intentionally to serve the needs of intelligence professionals and top executives.